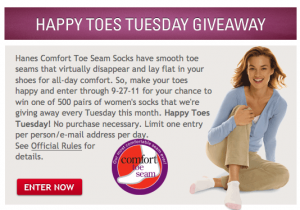 'Like' Hanes on Facebook to enter their Happy Toes Tuesday Giveaway! You will be entered to win one of 500 pairs of Comfort Toe Seam Socks. Enter every Tuesday this month!